The ratification as Argentina’s army chief of an officer accused of involvement in crimes against humanity during the 1976-1983 dictatorship has revived the debate about the thin line between the moral and judicial responsibility of those let off the hook by an amnesty law for merely “following orders”. The mystery still surrounding the massive business of stealing and buying babies, practised for decades in Spain by the regime of Francisco Franco (1939-1975), could start to be clarified in courtrooms in Argentina. The progress made by Argentina in trials for crimes against humanity committed by the 1976-1983 dictatorship has been tarnished by a growing number of human rights violators escaping from prison. As news of the death of former Argentine dictator Jorge Rafael Videla in a prison cell spread around the world, Julia Parodi, who was in this South Korean city to receive the Gwangju Prize for Human Rights on behalf of HIJOS, said he died in the right place. Thirty-seven years after leading the coup d’etat that ushered in the most brutal dictatorship in the history of Argentina, former army commander Jorge Rafael Videla died in a common prison Friday. 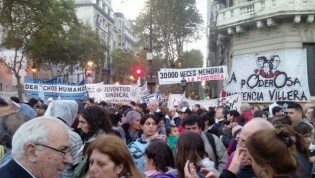 In spite of repeated violations of house arrest by people convicted of crimes against humanity during Argentina's dictatorship, some activists remain in favour of this lenient alternative to prison, but they want better oversight by the courts. The biggest trial for human rights crimes committed by Argentina’s 1976-1983 dictatorship began Wednesday in Buenos Aires, with 68 people accused of crimes involving nearly 800 victims of the Navy Mechanics School (ESMA).